Almost 30kg of plutonium apparently missing from the Sellafield nuclear plant is simply an auditing issue, it has been announced. The UK Atomic Energy Authority (UKAEA) confirmed 29.6kg of plutonium - enough to make seven nuclear bombs - was "unaccounted for" in auditing records. Operator, the British Nuclear Group (BNG), said it was a discrepancy between physical and book inventories. UKAEA said there was no reason to think there was any "real loss" of plutonium. In a statement it said: "The material unaccounted for (MUF) figures for 2003/04 were all within international standards of expected measurement accuracies for closing a nuclear material balance at the type of facility concerned." But Liberal Democrat environment spokesman Norman Baker said: "If the figures are wrong then this looks like serious incompetence from an industry that deals with highly dangerous resources." The figures also showed that 16.4kg of naturally-depleted uranium was also unaccounted for. 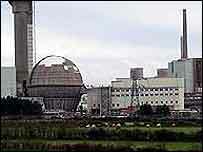 Sellafield reprocesses spent fuel and employs more than 10,000 workers at the site in West Cumbria. "There is no suggestion that any material has left the site. When you have got a complicated chemical procedure, quite often material remains in the plant. "We are extremely confident that the safety and security measures we have here at the site." In 2003 BNG revealed 19kg of plutonium was unaccounted for at the plant.